Rob Zollman, owner of Hands-On Music in Brandon, leads a drum circle outside of the shop on Center Street. Saturday, May 21 at 12 p.m. — BRANDON — Be part of something big! 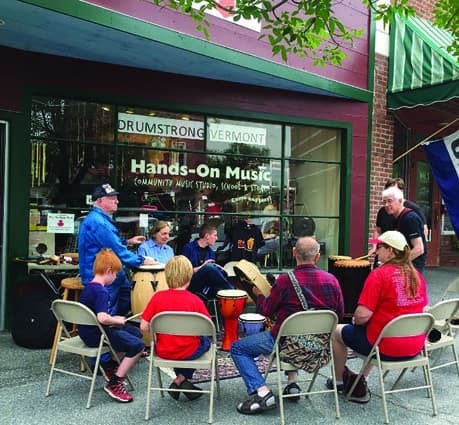 Join Hands-On Music, 27 Center Street in Brandon on Saturday, May 21 for the 3rd annual Drumstrong Vermont, a five-hour drum-a-thon to raise funds and awareness in the fight to beat cancer. The event starts at 12-noon. Each year in May, Drumstrong events raise awareness and funds for cancer organizations globally through family friendly rhythm gatherings. The main event in North Carolina is a weekend festival where this year the drumming goes for 12 straight hours. A past event went for 30 hours and made it into the Guinness Book of Records. Drumstrong Vermont is more modest, but every bit as energetic and committed. The drumming starts at noon at Hands-On Music, and goes continuously until 5 p.m. Drum for as little or as much time as you’d like, but at least three people must be drumming at all times. Instruments will be provided, or bring your own percussion instrument (drums, shakers, woodblocks, bells, frying pans, etc.). For more information, contact Rob Zollman at drummerrob@WholeMusicLearning.com, or phone or text 802 345-1714.